Sometimes the find of a century is claimed, but overlooked for years. This seems to be the case for Gold Road Resources. Listed in 2006, originally under the name Eleckra Mines Limited, its current holdings were originally owned by three separate companies – Asarco Copper, Yamarna Goldfields and Terra Gold. By combining the holdings of the three companies, Gold Road Resources was able to purchase an area that covers more than 5,000 square kilometres, and encompasses virtually the entire Yamarna Belt in Western Australia. 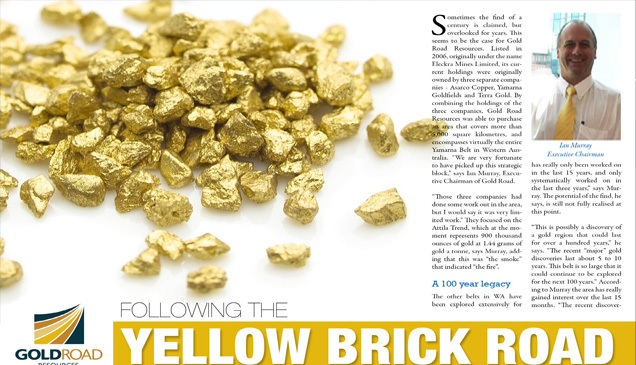 “We are very fortunate to have picked up this strategic block,” says Ian Murray, Executive Chairman of Gold Road. “Those three companies had done some work out in the area, but I would say it was very limited work.” They focused on the Attila Trend, which at the moment represents 900 thousand ounces of gold at 1.44 grams of gold a tonne, says Murray, adding that this was “the smoke” that indicated “the fire”. The other belts in WA have been explored extensively for over 120-years after being discovered in the 1880s. “Our belt has really only been worked on in the last 15 years, and only systematically worked on in the last three years,” says Murray. The potential of the find, he says, is still not fully realised at this point. “This is possibly a discovery of a gold region that could last for over a hundred years,” he says. “The recent “major” gold discoveries last about 5 to 10 years. This belt is so large that it could continue to be explored for the next 100 years.” According to Murray the area has really gained interest over the last 15 months. “The recent discoveries have yielded finds of 1,000 grams gold per tonne in one area alone,” he says. Looking at the Attila resource, which only contains 1.44 grams of gold per tonne, it is not hard to see why Murray and Gold Road are very excited about their find. “That’s one kilogram per tonne, it doesn’t matter if we are talking metric or imperial, it is still bloody good!” he laughs. This specific discovery was found in an area known as Central Bore. “It was found about 15 months ago, since then we have done four drilling campaigns, using reverse circulation drilling, and diamond drilling. Every time we have drilled we have discovered gold at greater depth and at greater quality. The deposit so far is 800 meters long – north to south – and extends from the surface to a depth of about 350 metres. It remains open to the north and to the south, and open at the depth.” Gold Road has already established that it is a substantial find, and the more they dig the more they find. Gold Road’s geology team has extended their investigation to a six square kilometre around the Central Bore area and have already discovered three more potential finds. “These discoveries look as good, if not better, than Central Bore,” says Murray. The first new discovery is east of Central Bore, and is known as Justinian. “The first RC drill hole that we put down encountered gold across 7 metres at an average of 27 grams a tonne. Another drill hole that we put down hit continuous gold for over 50 metres,” he says. These are great finds, and they will continue to explore and develop these finds throughout 2011. Gold Road’s main focus is to discover how these finds tie in to their main stake at Central Bore. “The grade of gold that we found at Central Bore has blown us, and the market, away. It is very rare that you hit grades as high as we have,” reports Murray. Central Bore is a narrow structure vein that varies in size from half a metre to 2½ metres. He also says that the Attila resource runs for about 33 kilometres. Gold Road’s total gold resources in the entire region is about one million ounces, and the company’s market cap stands at $130 million dollars. They have gained the interest of investment companies and institutions that are beginning to realise the scope of the find that Gold Road now owns. “It is potentially the next big gold belt discovery in Australia – if not the world.” He drives home the point that this area could sustain gold projects for the next 100 years, and says he has never been involved in a project that has had this much potential right from the start. Gold Road Resources might stand to make a lot of potential investors happy in the next few months, and it is certainly one stock worth watching.